The Jam emerged from the punk explosion of 1977, combining the energy of that movement with the musical values and styles of the previous generation's mod icons. 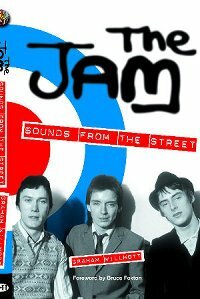 The Jam: Sounds from the Street is the inside story of Paul Weller, Bruce Foxton and Rick Buckler's rise to fame, their brief but momentous reign and their shocking decision to quit at the peak of their success. This authoritative chronology of the band's career weaves around an in-depth study of the band's entire musical legacy, including songs from their time as a four-piece and all the other tracks that comprised the pre-Polydor set list. Featuring exclusive contributions from Bruce Foxton, this is the essential account of one of Britain's best-loved rock groups. Published by and in all major bookshops from 31st October 2003.